Digital marketing without content marketing is like a car which is running out of gas. It won’t get you very far. Content marketing is a big part of creating relationships with customers, branding your company, getting noticed and remembered. It’s the reason your customers come back to your website. They read your blog, the knowledge base or case studies. 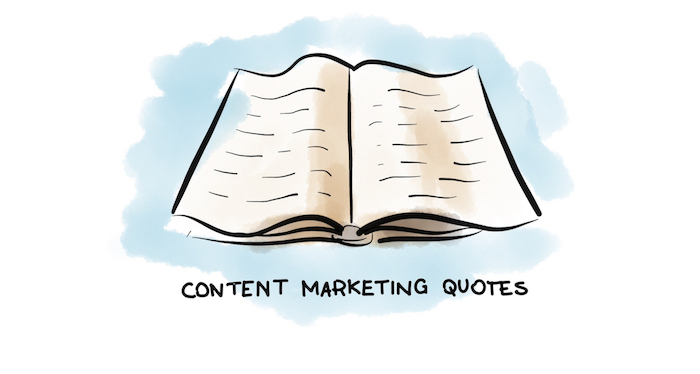 So, let me show you 5 content marketing quotes that hopefully will inspire your content actions. Search engines arose out of the unmet need to easily locate websites and content within those sites. Now they aggregate and bring back useful websites. That’s why it’s so important to create content and being SEO aware at the same time. Without SEO, content is like a bird that can’t fly. If you create content, you surely want people to read it. That’s why you need to be aware of what people are looking for using search engines and then try to provide it. One thing is knowing what people are looking for, the other is to provide them the answers. Let’s face it – there’s a lot of poor content online. Maybe it’s because of the lack of content specialists or because people who write it care only about click rates. I agree, content should drive traffic to your website, but what’s next? You won’t convince a visitor to become your customer with poor content. They rather leave and won’t come back. Content should teach your readers. Your company blog or a knowledge base are great places to increase your buyers’ awareness about your product. Having a knowledge base with a great explanation about your product saves a lot of your agents time. Imagine customers who are keep coming back via chat or email, asking the same questions, and your agents always have to answer them. It’s not efficient at all. Having a knowledge base will lower the number of such cases. Let’s say a customer has a question and he types it in Google: “Can I make a return in a store X?” He will find an answer in your knowledge base, if you have one. If not, he comes to the chat or sends an email asking about that and agents can send a link to KB where everything is explained. Either way, it’s much more efficient. Well said Drew. Email marketing is a great way to keep in touch with customers and regular readers. It’s also a great way to turn leads into customers. If used right, email is an effective medium to spread knowledge. To do that you need to compose newsletters that are informative and valuable for your readers. These can be blog newsletters informing readers about new content, monthly newsletters that gather the best content and that smuggle knowledge or newsletters about webinars and podcast. There is all kind of content that your readers could find useful. Besides providing answers that readers are eager to find, content is responsible for building relationships with its readers. One comment here, one comment there and you start having a relationships with potential customers. Let’s not forget about social media strategy for promoting your content. It’s a good place to find new fans of your product. Content drives traffic to your website and it helps you to build relationships with your readers. Make sure you share valuable, high quality content. Whether it’s a blog, a knowledge base, newsletters or your social media sites. Content allows you to teach your readers in a subject that is useful for them. It also provides the knowledge they need to use your product to its full potential. Or at least that’s what I like to think about my job. If you liked this post, you might also be interested in Great Marketing Quotes for Breaking the Ice with Your Audience.